Hands down the best magazine available for car reviews. Both the words and especially the photography are top notch. Here's the but though, the app is atrocious. Very unreliable for updates. Totally spoils the enjoyment of reading this great magazine. Why change the old app? Old app was a lot better; why being tied to a magazine format that does not makes sense in the digital world. I'm a long time Evo fan but I let my subscription lapse. After all the price hikes and having old issues disappear, I'll just visit their web site eve if the news is delayed. Since my earlier, much more detailed review mysteriously disappeared, I am simply giving a 1 star review because I can't be bothered again. Still love the content. Hate the new format. I don't need my subscription magazine to look and feel like Jalopnik or twitter. They already have the blog and feed systems down pat and Evo isn't about to revolutionize that. Oh and finally, getting a new iPad seems to mean that I can no longer "restore purchases". All new content is locked on the new device. It all shows up fine on the old iPad and on my phone. I've emailed Evo about this and will cancel my subscription if I can't get a resolution. This is just a lot of hassle. App was fixed shortly after the last update almost a year ago. Works perfectly for me. Nothing I can add that hasn't already been covered by others. I am a paying subscriber and want to echo that I much preferred downloading whole issues monthly rather than this new blog type, individual article layout thing. Please fix this. As a long time subscriber, I have to echo some of what has already been said and agree with the general disappointment in the app. The contents is fantastic as usual. That I can't fault. And I could probably get over the blog like quality of the new app and be OK with it. Having new material often is nice, but I liked the anticipation of the arrival of a new issue that the old version had. The one thing I can not get past is that the app seems to crash just about every time I use it. Open the app, tap on an article, settle in for some great reading, and boom! It crashes with no warning. It's to the point that I can't keep up with the articles because I can't read them. It just crashes when I try. I'm on an iPad air with the latest updates to the so and app, so it's not like I'm using some old hardware or something. Please EVO, if we're not to have our old mag back, at least make sure this one works. I had this app on my previous iPad since it's original release. After installing it on my new iPad it won't recognize my iTunes account, so I can't restore my old purchases or PDF issues. I'm really beginning to hate this app. I was a print subscriber for 4 years and am thinking about ditching the magazine all together as the print was quite expensive. So much for my $60 renewal fee they took out in February. The content is excellent for car fans in any country. Sure, many of the cars reviewed aren't globally available, but the content is still well worth the subscription price. The app is horrid. Half the time it doesn't pick up new content that you see notifications for. It crashes constantly trying to download. Landscape mode seems much worse than portrait for crashes and freezes. Frankly, the app was better when it was a simple monthly download like Top Gear. At least you could read it. I'd much rather have monthly updates I can read than weekly updates I can't see because the app crashes all the time. EVO is well and above other car magazines. The articles are well written and the composition is superb. The detail and content written is palpable. You truly get a sense of what the car being reviewed is like to drive and experience. The app is a fantastic digital experience of the tangible material. The photos are high resolution and beautiful. The app is easy to use and organize your magazine purchases and subscriptions. Highly recommend for those looking for high quality and quantity automotive journalism. This thing is awful! You can't tell where you are or where you have been. It doesn't store the issues, so no reading on a plane etc. Completely over complicated and useless. Evo charges $6/month for an app that will not work. That is called stealing! Until they fix this, all users are advised to stay away from this non-functioning money sink. Too bad given the quality of the content, but these guys need to hire a developer who can actually program. While evo content is great, the app doesn't meet any usability standards. For example, to archive old issues you have to dig through various menus until you find the function. Worst of all the app is now preventing me from downloading new content and just keeps saying: "Ooops, something went wrong..." Despite me having a subscription via itunes for another 9 month. Go test the american Road & Track app. That is how 5-star is done. 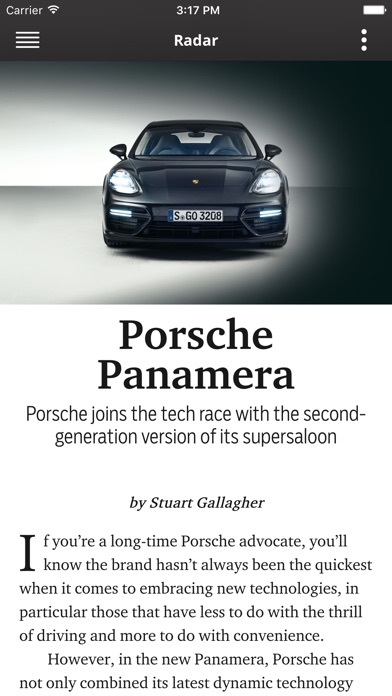 How do you take something as simple as reading a brilliant car magazine and screw it up so badly? The content is still good, when I can read it. For example I have yet to read the 2023 eCOTY because it keeps crashing. Nothing else crashes... Please, for God sakes, throw this app away and start over. You have a great magazine, don't ruin it with such an absolute garbage delivery. I would LOVE to have my old PDFs back. I'm a pretty long term subscriber and at the point of reconsidering my renewal given hoe bad it has become. The new version is still locking up after a few minutes. I haven't been able to make it all the way through the article about the McLaren F1 and P1 without the app freezing. Very frustrating. Great writing and articles. Great photos. Crap app! Update: 3 days after my review, both my iPhone and iPad started downloading articles again. My guess is there was a server issue rather than an app issue. App still freezes in landscape mode, but at least I can read my articles again. 2 stars. I didn't think it was possible, but the new version is even worse than 3.4.5. I have deleted and reinstalled the app a dozen times. Once I was able to read the three most recent articles, but nothing else would download. Now, I can't get ANY content to download. I'm just staring at a gray background. Click the "help" button and the app crashes EVERY SINGLE TIME. I sent several detailed emails to the developer, but they can't resolve this. They should send me the print copy until my subscription runs out. I will not be renewing. Two stars for content...however, haven't had content update in a month? What's the deal guys? New app is much improved - it let me read most of two articles before it froze. FIX IT. EVO Magazine is the best car magazine on the planet, bar none. Best Writers, Photographers, Drivers, etc. No boring cars. Excellent editing. What R&T and C&D were 30 years ago, but with a British twist, and far better card stock on the Magazine. Evo is still without a doubt one of the best motoring magazines around. That said this app now constantly crashes. Please fix! I also strongly believe the old magazine style app was one of the best in the industry, and gave you a real feel for reading a monthly cohesive magazine. Albeit one designed for the future with loads of interactive features. It was well designed, it worked, and it sparkled. The current app is "blog" style. It doesn't have the cohesive magazine feel, it's much less interactive, and it's buggy. In short, while the articles are still good, the app has gone from being awesome and an industry leader to being meh, barely working, and frankly the paper magazine would be a better experience. This app is buggy. I am unable to receive articles regularly and the help desk are unable to assist beyond suggesting a reboot of my device. I feel cheated as I can't access material that I have paid for in advance and the Evo staff are unable/unwilling to help. What a waste of what was a good magazine. I'm glad evo finally, FINALLY moved to a magazine format instead of the dribble of articles every few days. The print version was always my favorite car magazine, so switching a few years ago to the old app on my iPad was disappointing. It never captured the feel of the print version for reasons I can't entirely explain. I've only read one new issue, but it is much better and I'm hopeful it'll be compelling reading like it used to be. EVO should fire this app designer. I have never experienced a less stable app. Crashes constantly, before and after each update. Doesn't someone test this before it gets released. Does anyone at EVO care that their good work is being ruined by a poorly executed app! Go to the website or YouTube to get your content instead. It's not worth the annoyance. Old bad reviews are outdated, from what I can tell the app works great and looks good as well. Ruined perhaps the greatest magazine on earth. Perhaps worst update in digital magazine history. App stopped updating for the last 4 weeks (my experience when the app is working is that it's updated every 3-9 days with new content). I believe the rationale for EVO to adopt this format of randomly updating this app with content was to be at the forefront of news topics or have the latest test drive reports to be out the door first thing. The intention was good but YOU NEED TO HIRE SOMEONE ELSE TO MANAGE YOUR APP. This is frustrating, very frustrating. You have top quality content, written by some of the best people in the industry, yet you're utterly failed by a very unstable app. I've been a digital subscriber for a long time, and this has happened at least 15-20 times. Makes me wonder if you actually want to piss people off the digital version and make them go back to the print version. The thing crashes, freezes, takes an age to download content. I’ll be unsubscribing at the end of my current subscription. This new app interface is absolutely horrific! With this new "continuous update" feature, you really have no idea which articles have been downloaded to my iPad. Please give me a simple way to just download the latest issue so that I can actually read it while I'm on the plane! And I hate the new layout - or lack there of!!! Stopped allowing access to articles in new version even after I've signed in and restored purchases. Up until the past few weeks it's been great. Extremely disappointed with this and ready to cancel my subscription unless it's fixed quickly. Update 5/15. Broken again for the past 2 months. This is the only magazine app where I have issues like this. Will not be renewing my subscription. I loved the old app. I could download the mags i specifically wanted and not everything. The interactive nature was nice and the offline download allowed me to delve multiple times into my favorite the articles. Everything was simple and easy to use. With the new app I am unable to access the mags I bought earlier. The app doesn't seem to recognize my itunes password. Dead in the water. I am really bummed. App still doesnt work. Upgraded to the newest version of the app. Worse then before. App freezes and my subscription is unreadable. How hard can this be? Get someone that knows what they are doing to fix this. This is a great magazine. I subscribed while living in London. Was really happy to get the app and subscribe electronically when I moved to the USA. Unfortunately I have had endless issues trying to download magazines. The earlier version of this app worked. This version has not allowed me to download anything since renewing my subscription. 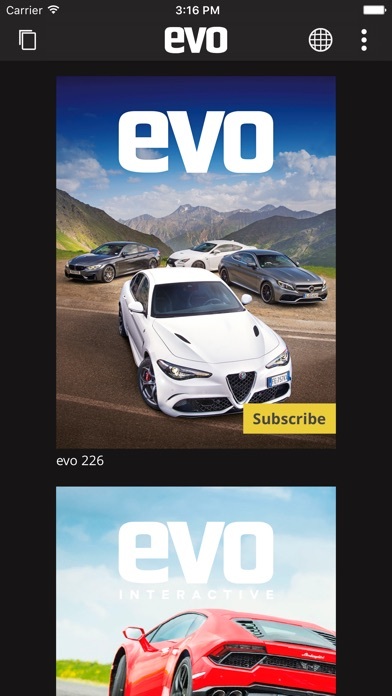 Don't get me wrong, I LOVE the content from evo magazine. It is by far the best car magazine available. BUT... this app is broken. Since the last update it went from buggy and clunky to total junk. It no longer even launches successfully, just a title screen for several seconds before it gives up and kicks me back to the newsstand. And I pay for a subscription! Not for long I guess. I will look forward to a fix. I'm a long time subscriber, but as of lat I can't access the "premium" content, even after I restore my iTunes subscription. So, I'm paying for something I can't use. I decided to purchase the app instead of the print subscription for the convenience and the environmental benefits of going paperless. What a big mistake! This app crashes EVERY SINGLE TIME I try to use it. When it is working, which is rarely, the downloads for the content take forever. Makes the whole experience a hassle. Please, please, please fix this!! I want to enjoy reading about the joy of driving once again. Is that too much to ask for?!? I've never owned an app that was this horrid. Whomever wrote this quite obviously never actually uses it. It is simply awful. I have the most current version and a 2014 iPad Mini Retina, which has no trouble running every other app I have. The EVO app has always been slow and buggy, but the current version takes it to a new level of awful, rancid brokenness. This is particularly frustrating given the fact that the writers are the best in the business, as are the photographers. I really want this thing to be great, you know, like the actual magazine is!??! I'm a huge fan of evo, which makes this all the more painful, but I despise this version of the app. It's difficult to see what you have and haven't read, so I feel like I'm missing content, and if you leave partway through an article, it doesn't remember where you left off, so you spend more time navigating than reading. Now it crashes every time I try to use it about 15 seconds in, so it's truly a waste of money. They turned one of my favorite pastimes into a huge frustration. Boo, evo, boo. I'm a long-time EVO print subscriber so I obviously love their content. That said this app is just plain unusable, and whatever updates were made still don't work. Even the survey part of it, where they try to solicit feedback on technical issues, didn't work and froze the app. This is on an iPhone 6 with tons of free space after a fresh restart. C'mon guys. . . I build this kind of stuff for a living and it just isn't that hard. Up until about a month ago the app worked and there would be updates every few weeks. However, I've yet to see the July issue in the app and August is now out. 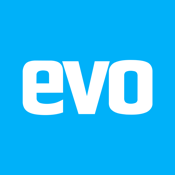 Evo is a great magazine with great writing and I've been a subscriber since the early days. I bought the July issue via Zinio and while it doesn't have all the features of the Evo app, if I can consistently get the magazine, it's probably the best option. As a long time reader of EVO, I am very disappointed with the new electronic format. I subscribed to a magazine, not a blog. This app lacks the flow of the magazine proper and feels cheap by comparison. The navigation, or lack thereof, needs fixing ASAP. Excellent revision addresses all of the issues of the previous app version. Content is now delivered immediately, not as fragmented (and seemingly random) updates over the course of the month. The content is still stellar, and now has an app that does it justice. I have been a longtime reader of EVO, rating it the best of all the car magazines. However, since I upgraded to IOS 8 on my iPad 2, the app is now pretty much unreadable. 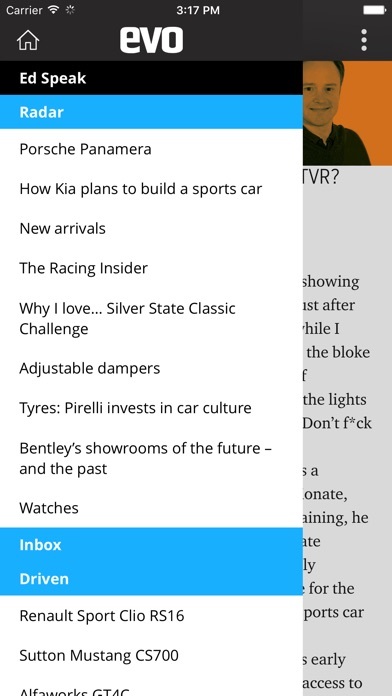 I blame the IOS upgrade rather than the app but the end result is the same, I can't read the magazine! I have spent only a few hours with the new Evo App, but I can say that I am very impressed. I have appreciated both the passion for the work and the quality of the writing for several years with the old "app" and the new format only make it easier to access. I look forward to each new issue far more than the business publications...which help support my auto-addiction. Thanks for that!